Save on Outdoor Furniture by Ordering Before April 30th Summer will be here before you know it and ordering your outdoor furniture early will help you enjoy every bit of it. Barlow Tyrie teak, stainless steel, woven and aluminum furniture enjoys a long-standing reputation for superior workmanship and classic style. 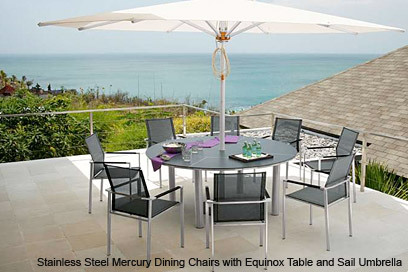 Shown below from left to right: Mercury deep seating, Ascot folding chair and Kirar woven furniture. Discover the smart style of the Revol Revolution Tagine as featured in Food + Wine Magazine on the Didriks blog. The Linens by Didriks blog Thinks Pink with the new Fjord table linen by Libeco Home. Our Dinner Series blog recently visited a class given by Season to Taste Catering for An Education in Gnocchi." iittala Teema Dinnerware Simple yet elegant. This Finnish designed dinnerware is a contemporary classic. Simon Pearce Hampton Stemware Hand blown stemware for all occasions. A bridal registry favorite! Berti Medium Chef's Knife Exceptional balance and edge sharpness. Hand crafted in Italy.